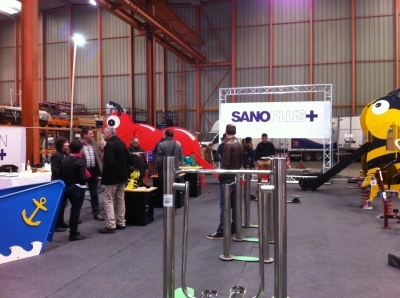 During 13th and 14th March 2014 and by our official distributor in Geneve, Sano Plus www.sanoplus.ch, collaboration we have done a private and exclusive Show Room, exhibiting our playgrounds equipment, especially Bichos Bugs line, urban furniture and fitness equipment as much in galvanized and stainless steel. This presentation taked place at Geneve center, closed to Rolex central, in the presence of authorities, canton technicians and other public and private potencial clients, all of them with great relevance. For us and especially the commercial team moved there, was a great satisfaction all eulogises we received regarding to our products and company philosophy in a tough country like Switzerland. This action has been schuduled and done among our international expansion plans, which is viewed favourably for Spaniard mark as good quality, designs and services. We use the occasion to fully express thanks for Sano Plus efforts, making the event possible and especially to all authorities, technician, public and private visitors.